Wooden toys are perfect for babies of all ages – they come in a variety of styles sure to suit all tastes. Wood is a great, long-lasting material for babies to chew on and throw around, so parents can be sure a wooden toy will last their baby for many years. Here, we have compiled a list of our favorite wooden baby toys and picked out their key features, so you can find the perfect toy for your baby. There are a few things to think about when choosing a wood toy for your baby. First, you should consider safety. Make sure you choose a toy made by a brand with a good reputation for producing high-quality goods. It’s crucial to make sure the toy is made with safe, lead-free paint. Choose a toy which suits your baby’s developmental stage. Make sure the toy isn’t too simple for your baby, or they will quickly get bored. On the other hand, a toy which is too advanced can lead to difficulty and frustration. Wooden toys come in a variety of shapes and sizes, so think about the kind of toy your child needs. There are small toys which are perfect for giving as gifts, or for your baby to take in the car. If you are looking for a larger toy to entertain your baby for longer periods, consider a wooden activity center. This large wooden educational toy is perfect for babies who are able to sit independently. It has five sides each offering a different activity to teach and entertain your baby. One side has letters on it, which turn around to reveal a picture of something starting with the same letter. Another side of the classic wooden toy has doors which open to reveal different people standing behind each one. The toy is ideal for babies who are learning to stand and walk, as they can lean against the cube for support. It is great for encouraging them to stand as they will be entertained by the wooden bead activity on the top of the cube. 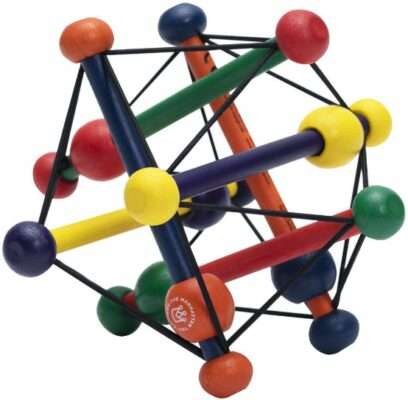 The activity cube toy is made of great quality, sturdy wood, and non-toxic paints. It’s sure to provide hours of entertainment for your baby, and will still be enjoyed by toddlers. This cute wooden elephant toy is perfect for babies aged around 9 months old and above. The chunky handle is great for your baby to push the toy along as they crawl. The fun, friendly elephant design is sure to appeal to both boys and girls. The toy is made from strong, thick wood, so is able to stand up to being pulled and pushed around anywhere! The size of the handle makes it easy for babies to grip and push. The pull-along toy is also super for toddlers, who will love to pull it along behind them as they walk around the house. 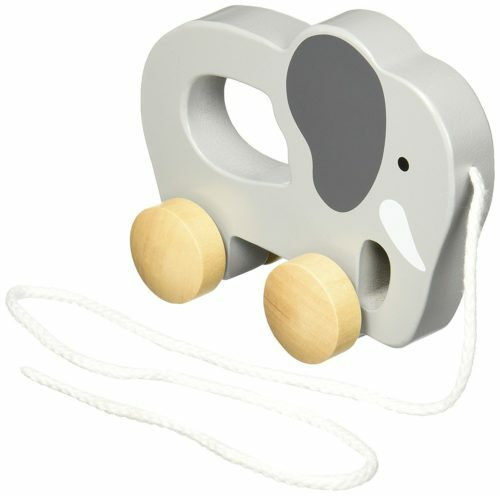 There are a range of other wooden pull toys in this range from Hape, so if your child doesn’t like elephants, you’re sure to find something else to suit their tastes. This lovely wooden toy set is perfect for babies aged over 3 months old. The bright colors and fun rattle sounds are sure to catch your baby’s attention. They are perfect for improving your baby’s ability to grip objects and move and shake them to explore. The rattles are made from high-quality wood which has been polished to give a smooth, easy to clean finish. The paint used is environmentally friendly and safe if your baby wants to chew on it. The set of rattles would make an ideal gift for a baby shower. Babies will be able to start using the toys at a young age and will continue to enjoy them for many months. As well as improving hand-eye coordination, they can be used for teething. Toddlers will love to make a band with their friends using these fun wooden rattles too, so you can be sure they offer great value for money. This cute, small wooden toy gift is perfect for 6 month old babies. They will love to twist and turn the pieces to make the worm into a variety of different shapes. They toy is painted with natural paint, so it’s safe for young babies to put in their mouths. The Melissa & Doug wood toy is easy to manipulate, making it perfect for babies to practice their motor skills. The bright green paint is great to catch young babies’ attention. The compact toy is perfect for taking in the stroller or on long journeys, where it is sure to entertain your baby for hours. This traditional wooden toy is suitable for babies of all ages, right from birth. The toy is easy for even the youngest baby to grasp. They will love to twist and turn the beads, and the rattle can be flattened and will return to its original shape. Newborn babies will love to look at the toy before they can grasp it. Parents can attach a string to the top and hang it above the crib or in the stroller to give their newborn something interesting to look at. The educational musical toy is made from great-quality materials, meaning the paint won’t get chipped and it will last for years. 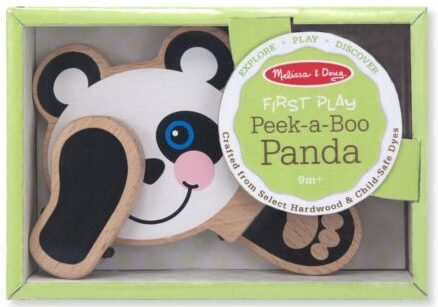 This classic Melissa & Doug wooden toy is great for babies aged 9 months old. The paws click and clack as they flap up and down to hide the cute panda’s face. The paws don’t snap back quickly, meaning parents can rest assured that their baby’s fingers won’t get trapped. The learning toy is great for allowing your child to develop their fine motor skills. They will be encouraged to keep trying as they are rewarded with the fun change in the appearance of the toy. The black and white color contrast is perfect for keeping young babies’ attention. This cute toy would make an ideal baby shower or first birthday gift for a boy or girl. This traditional toy is ideal for helping babies to practice their fine motor skills. It is also ideal for developing shape and color recognition, and hand-eye coordination. The pieces are nice and chunky, making them easy for young babies to grasp. The wooden puzzle is also perfect for toddlers. 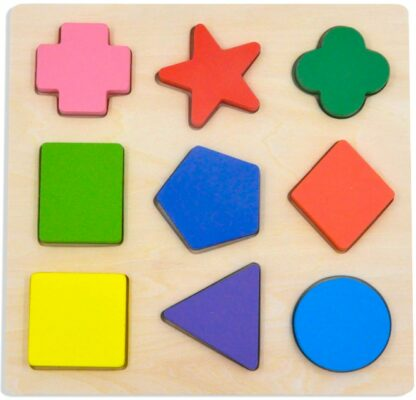 Parents can use the pieces to help their toddler learn the names of all the colors, and as they grow older, they can also learn the names of the different shapes. The puzzle is a great size for taking out and about to amuse your baby or toddler on the go. It’s also chunky enough that it doesn’t pose a choking hazard to young babies who might chew on the pieces. Boys and girls will love these chunky toy wooden vehicles. They are the perfect size for young babies to grip, and they are perfect to push as they crawl along. The vehicles are made of durable materials, so you can be sure they will last well into toddlerhood. The paint is non-toxic, and there are no small parts, making for a safe play experience for your baby. 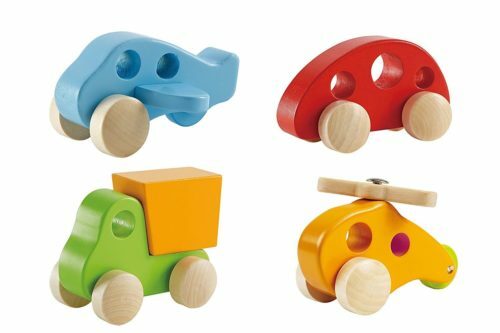 The traditional wooden vehicles are bright and colorful – perfect for even young babies. They are great for encouraging imaginative play. This great-value set of wooden cars would make an excellent Christmas or birthday gift. Parents will love to receive a classic wooden toy for their baby. This hand-made wood ball is the perfect gift for babies to use from around 6 months and up. The shape of the toy is unique and makes it perfect for grabbing and clutching. The bright colors are great for catching your baby’s attention. They can even be used for learning the names of colors as baby begins to understand more language. This toy is also great for using to help with teething. The paint is water-based and applied in several layers, meaning it won’t become faded or damaged even after being chewed. The natural wooden toy is made using sustainable wood from Germany, so you can be sure the environmental impact of the toy is minimal. If you are looking for the ultimate wooden toy for a baby, the ALEX Jr. Activity Cube is perfect. The toy gives great value for money, as your baby will be able to enjoy it for many years. The activity cube offers many educational opportunities for young babies and toddlers. It really grows with your child – they will be able to master more of the activities as they learn and develop. 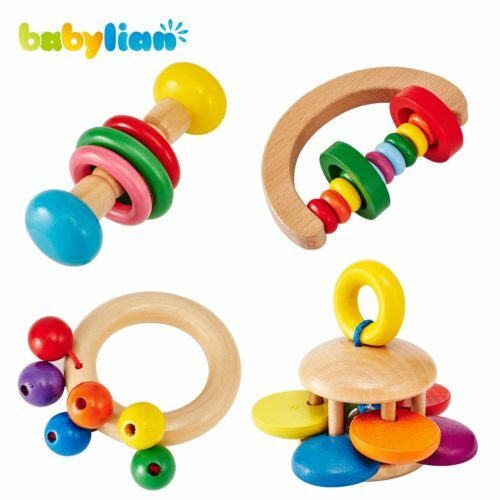 For those looking for a great wood toy on a budget, the Babylian 4-Piece rattle set makes a great choice. These classic wooden rattles are great for babies of all ages – the lovely colorful design is sure to appeal to both boys and girls. Your baby will love shaking and throwing these rattles around to hear the interesting sounds they make. The rattle toy is great for helping your baby develop during the early months.